The Chess Drum’s Highlights of 2015! The year of 2015 had so many highs and lows. In The Chess Drum’s 14th year, we posted 200 stories and a number of tournaments graced these pages. Apart from the Tata Steel tournament starting off the new year, there were several big productions announced including the Millionaire qualifiers held on the African continent (Kenya, Nigeria, South Africa). This spurred a level of excitement not seen in a long time. In addition, the African continent saw a relative surge in activity over the past year. The Chess Drum ran a three-part series on “The Drum Majors of Chess” on the history of chess in the worldwide Black community. 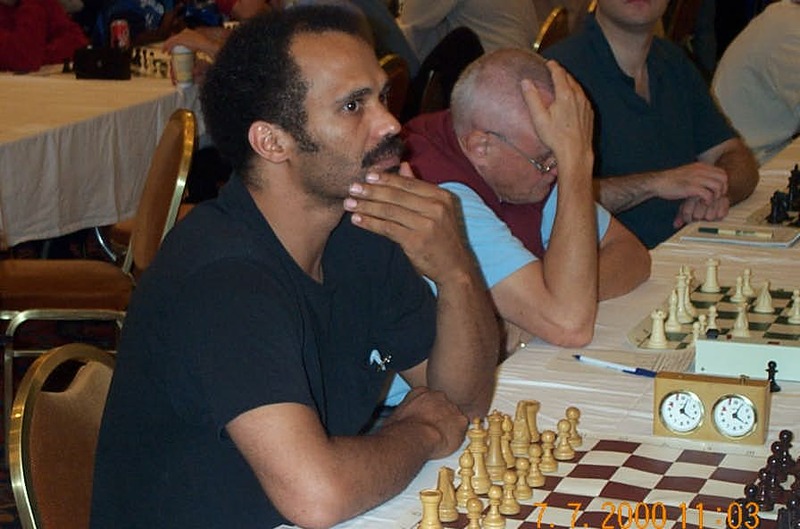 Speaking of which, there was the beautiful story of Majur Juac, one of the “Lost Boys of Sudan” who survived civil war and later became a chess master. There was Watu Kobese’s chess book in the Xhosa language, another effort showing the universality of chess. The story of Phiona Mutesi made its rounds in the media once again. Her story is to be made into a Disney film starring Oscar winner Lupita Nyong’o. Phiona recently granted a very poignant interview. In 2015, we lost a giant in IM Emory Tate. There was the exciting U.S. Championship which featured a bitter controversy involving Wesley So. Would most explosive story be Nigel Short’s provocative essay on women? It erupted into a tumultuous debate on gender in chess. Another subject of debate was the Fischer biopic “Pawn Sacrifice”. You can read my reviewhere. Spoiler alert! Of course there was the usual coverage of tournament both nationals and international. The Chess Drum is often branded as a niche site, but the coverage is quite diverse. There are the major events which included live coverage of the Sinquefield Cup, reports on the U.S. Championships, World Open and of course the World Cup. The coverage of the Millionaire Chess Open was also onsite and featured a number of interesting interviews. 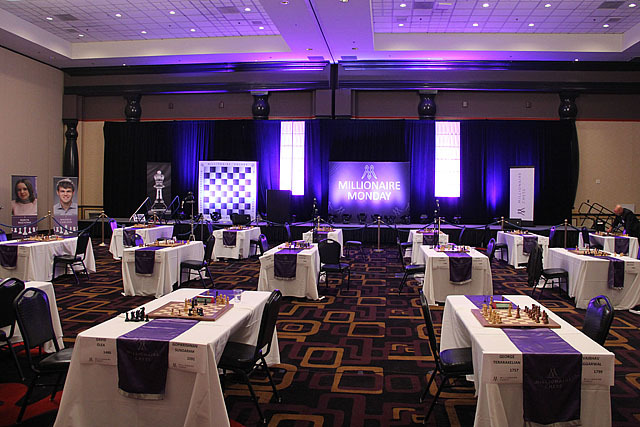 The Millionaire Chess Open had some snags but was still a epic event. We are waiting to hear more about the upcoming edition… or whether there will be one. If you want to merely see the reflections you can do so here. Finally the year had a rather sad ending with the passing of International Master Emory Tate (announcement, obituary, burial). He was iconic for his style, brilliance and his hyperactive energy at the board. What is ironic was that he received a lot more attention than seen for elite players who have passed away. He was very accessible and willing to share in his knowledge with you regardless of your strength. 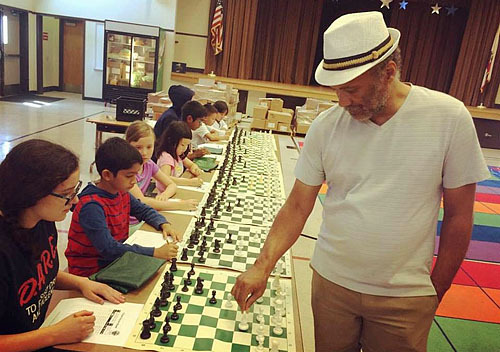 IM Emory Tate conducting a 30-board simul. He dedicated his entire life to chess. It just goes to show you that when you address the grassroots of chess, masses appreciate the effort. He played out fantasies over the board. We all have dreamed of sacrificing a queen or playing a game where we sacrifice two or three pieces for a blistering mating attack. Emory played out our one-in-a-lifetime fantasies and his large fan base was appreciative of his showmanship and willingness to be creative. He was not an elite player, nor was he a perfect person, but he traveled lightly and gave us what he had… all he had. Thank you! Rest in Power.